After graduating from the Blair Magnet, Chris Chen '02 entered Columbia University with a plan to major in Electrical Engineering and go to law school. Six years later, after earning a B.S. in Operations Research and an M.B.A. from Columbia Business School, Chen found himself in an unlikely position at the helm of the Dessert Truck – New York City's premiere stop for gourmet dessert on the street. Chen's unusual path through the business world began in the Magnet program, where he learned to think critically and reason through any creative pursuits. "You're able to look at a situation and analyze it top to bottom and look at all the options and risks," he says. Chen credits Blair for the great teachers, particularly mentioning Mr. Bunday and Ms. Dyas. "Specifically, Mr. Bunday is my buddy," he says. "I didn’t come from Takoma [Park Middle School] and I just kind of felt like I was behind and he kind of helped me get caught up with everyone." He also credited Ms. Dvorsky's Discrete Mathematics class for helping him switch majors easily while at Columbia. After taking introductory Electrical Engineering classes and deciding that the major was not for him, Chen switched to Operations Research. He says the major focused on "looking at optimization and stochastic modeling of systems," and his Discrete Math experience gave him some crucial basic knowledge. "I had some background so I kind of understood what it was," Chen says. It wasn't until Business school, though, that Chen was able to apply his skills to the real world. One of two students accepted to Columbia Business School fresh out of undergrad, Chen had business on the brain. His roommate at the time was Jerome Chang, a family friend and a pastry chef at Le Cirque in New York City, and the two would often think about food ideas and businesses to start. The idea came arbitrarily: "Wouldn’t it be great if there was a truck that sold gourmet desserts?" he says, recalling the initial thought process. Chen recalls that it was a "huge risk" at the time, but they went for it – they got the funding, licenses, and specially-outfitted truck (complete with a high-tech kitchen inside) – all while Chen was in his first year of business school. 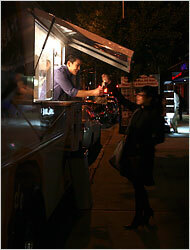 In October 2007, the truck rolled out onto the streets of New York City with gourmet desserts. Within one month, their confections were in the New York Times. Chang did the cooking, but Chen put his analytical skills to work running the business and operations. He soon found that the job entailed much more than just number crunching. "You pretty much have to be able to do anything, ranging from the finances, accounting, and operations to taking out the trash," he says. "If the truck broke down you would have to fix the truck." Without a budget for marketing, Chen and Chang relied heavily on word-of-mouth and Facebook. Despite the lack of formal advertising though, the business thrived: 300-400 customers were visiting each night. Chen's most memorable moment with the Dessert Truck was their "Throwdown with Bobby Flay" on the Food Network. The show's premise is just that: a popular food place is tricked into thinking that they're going to be on another show when Bobby Flay shows up and challenges the chefs to a cook-off. The pair was told that they were going to be on a show called "Food Roadies." Suspecting something was up, Chen posted on Facebook that Flay was probably coming to challenge the Dessert Truck. And sure enough, Flay showed up, claiming that he had seen their Facebook page (though Chen suspects that he was coming all along). The Dessert Truck defeated Flay, and its fame and fanbase continued to grow. Ultimately, last December, Chen and his partner decided to split ways. "I thought we were at a point at the company where we needed to head in one direction or another," Chen says. Chang did not share his vision, so Chen sold his stake to his partner and traded his truck keys for a job on Wall Street. Today, Chen works in a "Strategy and Consulting group" at American Express. With each job comes new lessons, and Chen is getting an insider's look at international business and the management practices in large companies. "At this job I am now I'm working with international partners. I travel out of the country and see how they do business there," he says. "At every job I think there's something you can learn." Still, Chen credits the Dessert Truck for an invaluable experience in the business world. "I worked at a variety of places ranging from sales and trading to management consulting and definitely running my own company was the most difficult job I've ever had," he says. "[It was] the one where I learned the most and grew the most." His advice to others is to go for it: "I definitely think if you have thought through [your idea] and you think it’s a great idea you should definitely do it."